Rigid foam insulation protects the roof cavity from condensation in winter. Attic vents and attic venting are the most familiar and reliable roof venting option. That was the subject of part 1 of this post. But they may not work depending on the building’s design. Features like sloping ceilings and cathedrals may dictate an unvented attic. An unvented attic and insulated roof are also a good idea if the building’s HVAC system and ducts are in the attic. This strategy keeps the mechanical systems inside of the building’s thermal boundary. If the building has an unvented attic, then the roof itself needs to be ventilated instead. Let’s explore some roof venting options that complement insulated roof cavities and insulated roof decks. Rigid insulation on top of the roof deck. Or air-impermeable insulation under the roof deck. Insulating the roof deck this way prevents ice damming and condensation on or near the roof decking material. Why consider venting unvented roofs? Installers sprayed 3 inches of air-impermeable foam under this roof deck. Designers and builders may not appreciate the damage that solar heat gain can cause to foam insulation or composite shingles installed over foam insulation. Here are two options to prevent heat damage to the foam insulation. Increase the insulation level inside the roof cavity and then to vent the roof between the roof deck and roofing. Venting these typically unvented roofs is the most reliable and durable option. The combination of red tile roofing or white colored roofing with a ventilated air space underneath blocks most solar heat from penetrating the roof deck and transferring solar heat into the building. Vented cool roofs can save about 20% on cooling cost compared to asphalt shingles applied directly on top of the roof deck. Venting the roof between the roof deck and the roofing is an excellent option. This works well with SIPS panel roof structure or any similar unvented roof cavity, such as a roof cavity filled with fibrous insulation. A vented roof cavity insulated with fibrous insulation and vented between the insulation and bottom of the roof deck may be vulnerable to moisture problems. Roofs can get very cold at night during the winter because they radiate their heat to the very cold night sky. If warm humid air ventilates the roof cavity the next morning, this can create condensation in the roof cavity. European-style insulated roof with a 3-inch ventilated space between the tiles and insulation. Alternatively, roof venting on top of the roof deck may be a more effective solution than venting underneath the roof deck. 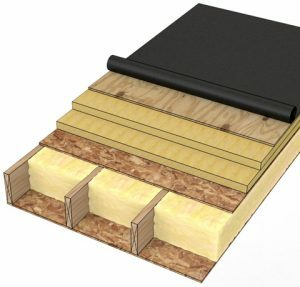 If the contractor sheathes the roof with a very vapor-permeable underlayment and installs battens to create a 1 to 2 inch cavity between the underlayment and the roofing, the fibrous insulation, roof decking, and insulation dry very effectively. Ventilation must keep roof surfaces cold during the winter and to exhaust moisture that affects the roof deck and building materials around it. Keeping the roof deck cold and well-vented may be difficult for complicated roofs vented from the attic. Roof features, such as hips, valleys, and dormers, create create air blockages when you vent the roof underneath the roof deck. A standard gable or shed roof creates an attic that is easy to ventilate. Wood I-beams, parallel-chord trusses, and scissor trusses create various depths of inaccessible roof cavities. 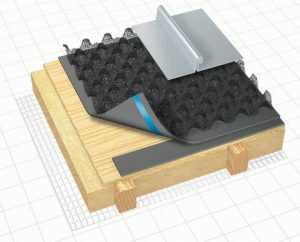 This vapor-permeable roof underlayment has a vent mat that promotes drying and keeps the roofing cold in winter. Roof ventilation pathways that connect the venting of a difficult roof section to an adjacent vented roof section. You can buy vent strips that sit on top of rafters and allow airflow from rafter space to rafter space. Or, you can ventilate the roof from above the roof deck. Special roof vents are designed to vent difficult roof sections effectively in addition to excluding wind-driven rain and snow. New vent types can vent roofs that meet walls and even roof valleys. When we install masonry roofing tiles over a vented airspace, this assembly creates an effective sunblock. The tiles collect solar heat and radiate it back into the sky or into the vented space below them. If the roofing tiles are a bright white, the roof assembly might block 95% or more of the solar energy falling on the roof. The red tile roofs work well for this purpose also but don’t block quite as much solar heat as bright white masonry roof tiles. A roof cavity insulated with fibrous insulation may be particularly vulnerable to moisture problems. Roofs can get very cold at night during the winter because of radiant losses to the very cold night sky. If warm humid air ventilates the roof cavity the next morning, this can create condensation in the roof cavity. Roof venting on top of the roof deck may be an effective solution to dry the roof’s building materials. 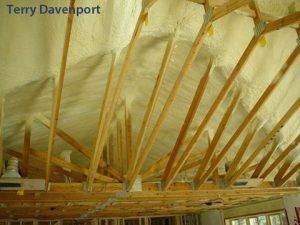 If the contractor sheathes the roof with a very vapor-permeable underlayment and installs battens to create a 2 to 4 inch cavity between the underlayment and the roofing, the fibrous insulation and roofing materials may dry effectively. The combination of tile roofing or white colored roofing with a roof venting space underneath blocks most solar heat from penetrating the roof deck. This dramatically reduces the solar heat transfer into the building. It’s important to remember that any attic or roof ventilation method needs to remove heat from solar gain. So it follows that stopping solar gain in the first place will reduce the needs for removing heat from the attic or roof. Shade from trees and using reflective coatings on the roof are the most effective means for blocking solar heat. Combine those with correctly designed roof or attic venting strategies to save energy and have a roof that will be durable for many years.